The eyes are 100% hand made to your exact specifications. There may be a little difference between the real eyes and the samples due to the hand-made quality. The difference of colors may be caused by color conditions of monitor. From another point of view, there are no eyes the same as yours in the world. I do my best to make your order as beautiful as possible. Urethane resin is a type of plastic, not acrylic. The doll's head and body are made of Resin. Transparency is as clear as glass. The iris color varies (more than 160 iris colors). It is possible to custom order, so E-D eyes can satisfy any customer's needs. You can choose various pupil colors. The material of the eyes will be replaced with Non-yellowing Urethane. And the eyes will be coated with UV protective spray. Also, the hardness of the eye's surface will be increased to protect your doll's eyes from scratches. Nevertheless, The surface of the eye can get scratched because it¡¯s not as hard as glass. As such, handle it carefully. If possible, avoid direct continuous light as colors may fade with time. First, you can choose the iris color in "E-D EYES", "SWEETY EYES", "MILKY EYES", "PEARL-SWEETY EYES" and pupil color in PUPIL COLOR. 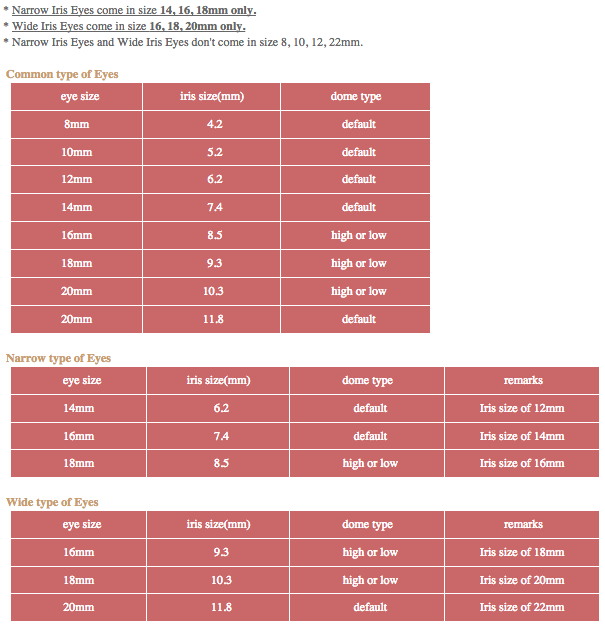 You can also choose the eye size (diameter) and height (high & low) of crystalline lens. You can choose High or Low Dome Lenses. The irises of High Dome Lenses protrude out more from the eye. Whereas the irises of the Low dome lenses protrude less from the eye. The sizes available (diameter of eyes) are 8mm, 10mm, 12mm, 14mm, 16mm, 18mm, 20mm and 22mm. You can choose either High or Low Dome Lenses with the 16mm, 18mm and 20mm lenses. With the 8mm, 10mm, 12mm, 14mm and 22mm lenses, there is no choice of High or Low Dome Lenses. They come in one common lens protrusion height. If you want larger or smaller pupils, please note as such in your order by writing, "larger" or "smaller". You will receive 0.2~0.5mm larger or smaller sized pupils. However, you cannot order the exact size of the pupil. Just know that your pupil will be a bit larger or smaller per your request. Though not to your exact specifications. Making 8mm and 10mm lenses is very difficult because of their small size. As such, they can only be ordered in Sweety type and Milky type only. You can make a special order about pupil colors only, not iris colors or pupil shape. Common iris - Standard iris for all eye sizes. 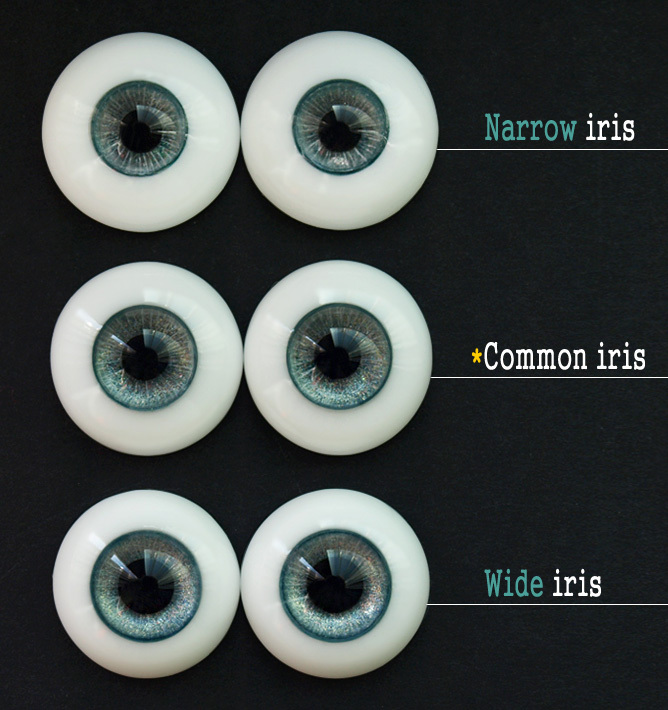 Wide iris - Available in 16mm, 18mm, 20mm only. Narrow iris - Available in 14mm, 16mm, 18mm only. Comparison photos of Common iris and Wide iris. 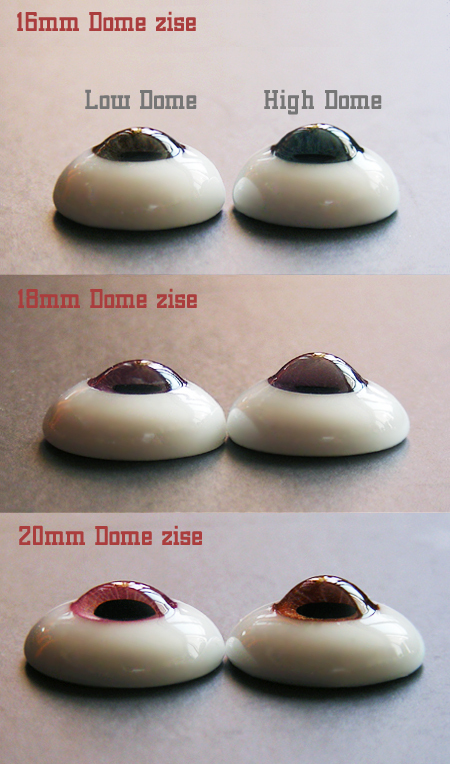 Low dome - Available in 16mm, 18mm, 20mm only. High dome - Available in all sizes. No.0 (black) is an ordinary eyes. No.1 and No.2 are limpid-red and limpid-dark brown. 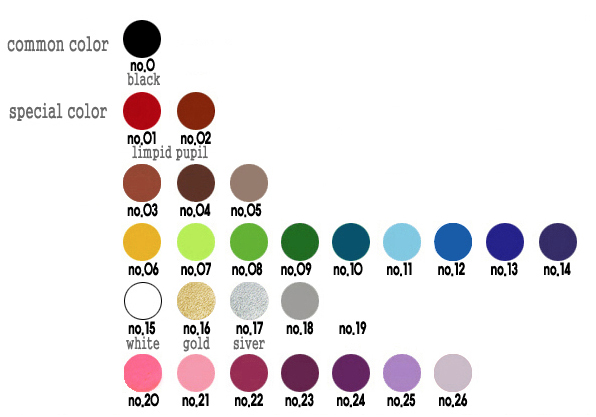 The rest colors(No.3 ~ No.21) are opaque. No.15 is a white, not black rim. No.17 is shiny silver color. Samples of special pupil colors. 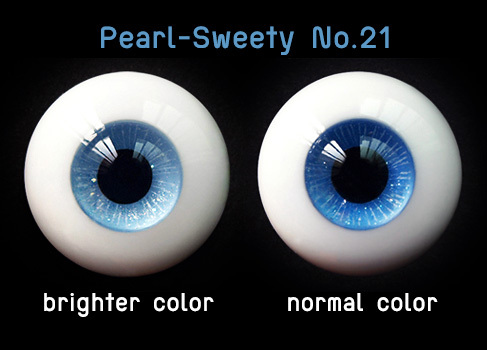 The price of pearl-pupil eyes are the same as other Special eyes ($10 added on the price of normal eyes). These beautiful eyes have silver and multi-colored pearl powder on and around the pupil. We were only able to capture silver color pearl powder in the sample pictures because of the viewing angle, but they actually have multi-colored pearl powder.